Hammam Maskhoutine (bath of the damned or the bath of the accursed ones) is located 15 km from the city of Guelma in northeastern Algeria and is one of the many spas in this region. It is actually a group of 10 different hot springs in a single valley. 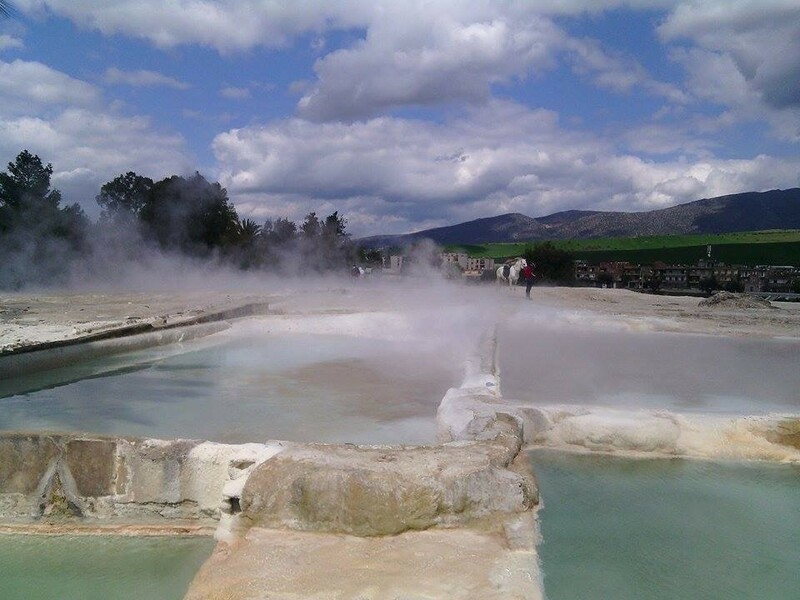 The temperature of the water in the springs can be as hot as 98 °C (208 °F); it is possible to boil eggs in the outflow channels. The overall flow rate of the thermal complex is 1,650 liters per second: nearly 100,000 liters per minute. The water is saturated with minerals such as iron and calcium carbonate. These minerals, as well as the heat, have been regarded as therapeutic for sufferers of ailments such as rheumatism and arthritis. Over the millennia, water has built a majestic limestone cascade rich in colors and conoid shapes. The name of the site Hammam Maskhoutine comes from a local legend in which a rich and influential king married his sister named Ourida(the rose), the most beautiful women ever seen ,in spite of the formal defense of the Koran and the elders of the tribe. As he looked for wife, he could not find any other for his liking except his own sister. The wedding was accomplished and accompanied by fantasias and dances ended by an immense feast. Plates filled with couscous and whole sheep are served to the guests. As the wedding procession, including the incestuous couple, moved up the valley, a curse caused the skies to darken, and the entire wedding party was struck with lightning and turned to stone. The elements are turned upside down, the thunder growls, the demon 's fire comes out of the earth, the burning waters flood the place of the feast, and when calm is restored, the king and his sister, guests, dancers and slaves changed into stones. 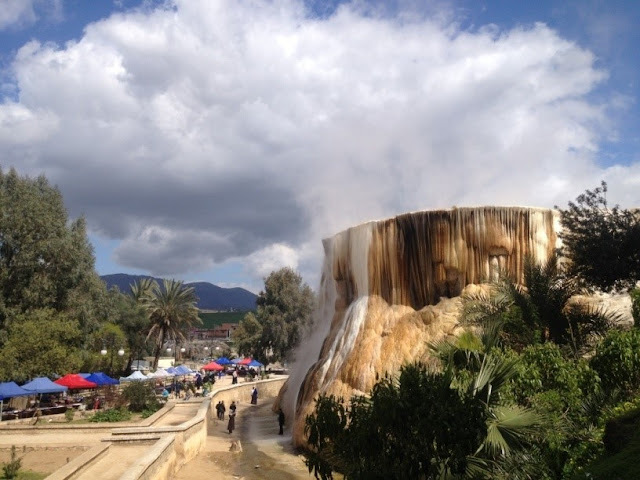 Guelma city is known for its thermal springs. It has 8 stations and includes 20 underground springs.Really, Hammam Maskhoutine is a unique site in the world. One has also to admire a large cascade formed of limestone with water spouting from its summit, water coming from the bowels of the earth, accompanied by steam that diffuses in the open air that gives an unforgettable view which attracted attention from locals and tourists alike since the era of the Roman Empire. The streams of water flowing on the limestone deposits of the waterfall create a fantastic image in contact with the rays of the sun. No one can pass without looking and enjoying this splendid natural scenery in the open sky. At the bottom of this waterfall, there is a basin where people bathe. A bath in is like a real makeover. Its waters rich in arsenic give a second youth to the skin. The Chellala complex, located in the municipality of Hammam Debagh, is one of famous thermal complexes in the city .It is the best equipped. It is renowned for its exceptional therapeutic waters. It is built on an area of 24 hectares. Hotel and therapeutic facilities are designed in such a way as to offer the best possible treatment to the patients. It has 112 bungalows, ideal for family stays and a hotel with 66 rooms. The Chellala complex is characterized by their exceptional therapeutic qualities, scientifically recognized in the treatment of many pathologies, including, rheumatology, respiratory tract, dermatology, urinary tract disorders, digestive disorders, cardio-arterial diseases, psychosomatic affections.